Ok…I had great intentions, last weekend, of finding the deal of the century for some front shock absorber towers, for the truck, out at the swap meet. I had a few leads, but nothing panned out. I decided to skip Saturday, so I could head to the HAMB Drags, but wound up spending the morning car shopping with my wife and daughter, and then ran over to Mickey’s house, to witness his maiden voyage, in his ’47 Dodge. He didn’t do any burnouts or set any track records, but he did get to drive his car, under it’s own power, for the very first time, and he was like a puppy with two tails! I’d take that, over the drags, any day! My “short list” is starting to get shorter. I didn’t get everything waxed, on the body of the truck, but it’s fairly clean. The oil was changed about within the last 250 miles. I changed the oil in the rear differential. 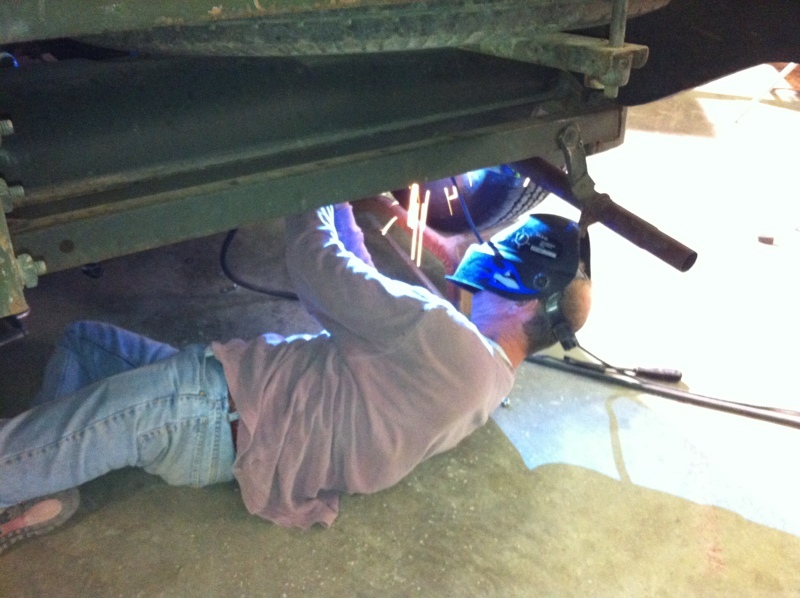 Last night, Doug came up to his shop and welded on some new rear shock mounts. I still need to squirt some rattle can on the stuff that we cleaned off to weld to and put the correct length bolts in the upper shock mounts. Thanks, to Doug, who taught me the motto, “Use your friends wisely.”, for running up to the shop and welding up the shock mounts. The truck drives so much better. Once the e-bay purchased front towers arrive, I’ll have some stability up front, too! Considering adding a puke jug for the radiator, but other than filling the tank and throwing my bag and a cooler into the back, I think I am ready to roll! Next stop, Dad’s house, and then we shall embark on our next adventure!